Automatic Door Openers are predominantly used in commercial and medium/high traffic areas such as schools, hospitals and local authority buildings. They are often able to be used both manually until automation is required, and are perfect for areas such as shop entrances. An electronic lock (or electric lock) is a locking device which operates by means of electric current. Electric locks are sometimes stand-alone with an electronic control assembly mounted directly to the lock. More often electric locks are connected to an access control system. 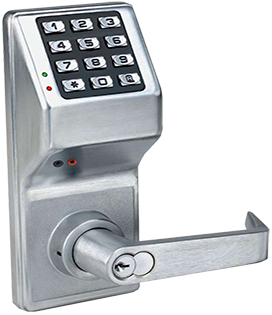 The advantages of an electric lock connected to an access control system include: key control, where keys can be added and removed without re-keying the lock cylinder; fine access control, where time and place are factors; and transaction logging, where activity is recorded. Electric locks use magnets, solenoids, or motors to actuate the lock by either supplying or removing power. 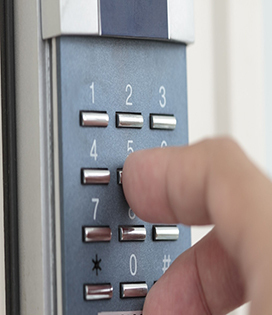 Operating the lock can be as simple as using a switch, for example an apartment intercom door release, or as complex as a biometric based access control system. Herts Security can supply and fit a wide variety of electric locks to your home or business, please contact us to find out more. Herts Security are fully qualified master locksmiths, skilled in gaining entry to all types of locks. We offer a full locksmith service to members of the public and local authorities including gaining entry to houses, safes and other secure areas. We work alongside constabularies to assist with gaining entry to properties as well as business premises. We are able to offer emergency call out services predominantly to residents of Hertfordshire and are available 24 hours a day. We are also able to gain access to vehicles in order to disable alarms or simply if you’ve locked your keys inside. We can supply and fit a wide range of locks for residential purposes including Yale and Chubb. Master Locking is a system where a series of locks can be accessed through a single ‘master key’, usually held by the owner of proprietor of a building or premises. There are many advantages to using a master locking system and they are certainly commonplace amongst businesses such as hotels. 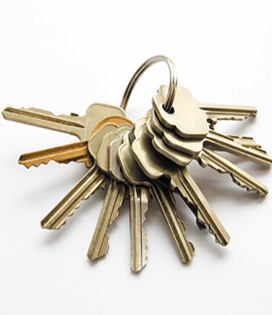 There are often 2 different types of master key systems available. The first would be a range of cylinders under just 1 Master Key. 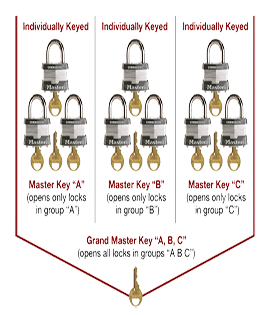 Every cylinder will have their own unique key but can all be opened by the Master Key. M/br> The second option is a range of cylinders that sit under an overall Master Key however sections of the cylinders may be opened by a sub master. A good example of this is a 2 storey building that you may own and rent out, the first floor is occupied by one business and the 2nd floor occupied by another business. Using this system of having Sub Masters, you could have a Master Key that opens all doors on both levels, then the occupants on floor 1 would have a key to their floor and likewise for the occupants of the second floor, but they cannot open each others doors. Herts Security can supply and fit a wide range of bespoke master locks for you or your business from the UK’s best lock manufacturers. Please contact us for more information. Access Control and Secure Entry Systems are vital for certain businesses across the UK, including local government buildings to high security establishments. Herts Security undertakes work in all areas of access control including door entry systems, access control systems, video door entry and integrated door entry to name a few. Electronic access control provides the most efficient and convenient way of securing your building and assets. Access control systems are flexible enough to cater for all requirements; the basic system can serve from one to one hundred users. Multi Site systems can accommodate several thousand users providing management with control over times of access to selected areas and by personnel. One of the most attractive features for management is that should a card or fob be lost, a fob can simply be deleted from the system and a new one issued. The lost fob can no longer gain access.When ordinary keys are lost, all of the locks need to be replaced to maintain security, this cost and loss of the building integrity is no longer a problem with an access control system. If you are interested in knowing more about our Access Control and Secure Entry Systems, please contact us for more information. 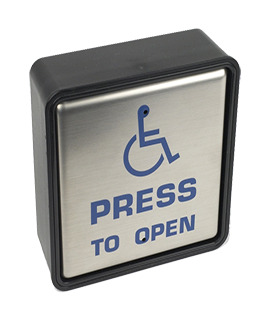 The ENiQ Mifare Digital cylinder is a mechatronic knob cylinder which can be installed in almost all doors. 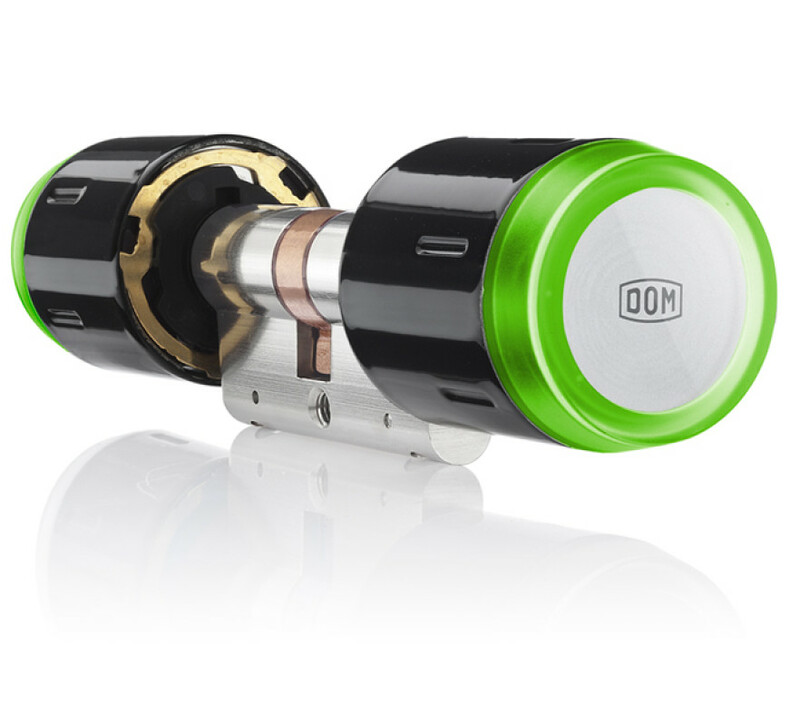 Whether in a new building or for retrofitting existing doors, the ENiQ cylinder can be installed without wiring. Within just a few minutes, an existing mechanical locking system can be replaced with ENiQ electronic access control. The ENiQ Digital Cylinder has everything as standard. It has IP65 protection against water and dust and is also fire resistant to 90 minutes. The ENiQ cylinder also fulfils the highest safety standards - it was awarded with security class "BZ+" by Germany's Association of Property Insurers (VdS) for its high resistance against mechanical and electronic tampering. It is also SKG 3 Star certified. Locking authorisations are managed via the master card or the ENiQ Access Management platform. The ENiQ cylinder is also online ready allowing easy connection to the software when used in conjunction with a DOM RF Net Manager Mifare, allowing instant communication and management. If you'd like to speak to us about our DOM services, please contact us for more information.